The meeting, organized by Profs. Eugene Gusev and Alla Guekht, focused on the recent developments in translational research and treatment innovations in cerebrovascular diseases, epilepsy, cognitive impairment and dementia, depression, demyelinating diseases, and others. It was held at the Buyanov City Clinical hospital, and was organized in partnership with the following institutions: Ministry of Health of The Russian Federation, Russian Academy of Sciences, Moscow Healthcare Department, Pirogov Russian National Research Medical University, World Stroke Organization, European Stroke Organization, World Federation of Neurology, International League Against Epilepsy, European Federation of Neurorehabilitation, All-Russian Society of Neurologists, Moscow Research and Clinical Center for Neuropsychiatry. The International Stroke Faculty included Profs. P. Sandercock (WSO, UK), V. Caso (ESO, Italy), M. Hilz (Germany), L. Østergaard (Denmark), and D. Muresanu, (EFNR, Romania). The WFN had been represented by Prof. M. Freedman (Canada); and the ILAE by Profs. S. Wiebe (Canada), I. Blumcke (Germany), A.Hauser (USA), E. Beghi (Italy), N. Speccio (Italy). Opening ceremony. Left to right: V. Caso, E. Gusev, A. Guekht, and P. Sandercock. The conference faculty had a high-level meeting with Prof. V. Skvortsova, Minister of Health for the Russian Federation, to discuss the management of stroke and brain disorders and highlight the priority this should be given both internationally and within the Russian Federation. An action plan on collaborative strategy in brain diseases has been discussed. The conference proved popular and over 700 delegates from 42 cities of the Russian Federation attended with additional registrants from Belarus, Georgia, Kazakhstan, Tajikistan, Ukraine, and Uzbekistan. The conference attracted a high level of media coverage and both Profs. P. Sandercock and V. Caso gave video interviews for local media organizations. The stroke session began with an update on controversies in thrombolysis by P. Sandercock, who highlighted the importance of not withholding thrombolysis to patients with ischemic stroke purely on the basis of age over 80. Meeting with Prof. V. Skvortsova, Minister of Health for the Russian Federation (center). Left to right: M.Hilz, S. Wiebe, N. Specchio, E. Gusev, V. Caso, S.Muraviev, M. Martynov, E. Beghi, L.Østergaard, M. Freedman, A. Hauser, A. Guekht. V. Caso gave a powerful talk on life after stroke in women. She highlighted the particulars of stroke management during pregnancy and demonstrated how gender inequality results in adverse effects in women’s health care in general and in stroke outcome in particular. M. Hilz gave a detailed overview of autonomic dysfunction in diseases requiring neurological intensive medicine. V. Parfenov covered management of patients after stroke, highlighting the value of lifestyle changes (quitting smoking, increasing physical activity, and fresh fruit and vegetable consumption) and antithrombotic therapy with aspirin after ischaemic events. I. Koltunov, N.Pechatnikova, and V. Kakaulina presented their work on cerebrovascular diseases associated with genetic metabolic disorders and demonstrated the program of genetic screening for rare diseases, supported by the Moscow government. A. Pryamikov, A.Mironkov, and O. Sazhina, doctors from the regional stroke center in the host hospital, closed the session with an interesting talk on their experience on carotid endarterectomy and internal carotid artery stenting in acute stroke. Meeting in the Moscow Research and Clinical Center for Neuropsychiatry. The session on cognitive and affective disorders was opened by the lecture by M. Feedman focusing on the diagnostic and treatment challenges of frontotemporal dementia. 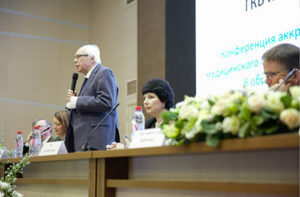 R. Akzhigitov and co-authors gave an overview on depression in neurological diseases, presenting the huge experience of the Moscow Research and Clinical Center for Neuropsychiatry with the effective programs of multidisciplinary management of depressions and cognitive impairment, including post-stroke. The session on the following day was dedicated to epilepsy. V. Krylov and I. Trifonov presented the results of the epilepsy surgery program, which is successfully developing in Moscow and other cities of the Russian Federation. S. Wiebe gave a thorough overview of the outcomes of epilepsy surgery. He emphasized that the novel way of conceptualizing surgical outcomes highlights the importance of longitudinal data. N. Specchio described special issues of epilepsy surgery in children. A. Hauser demonstrate how TBI and post-traumatic epilepsy represent a substantial societal burden. He reviewed the major risk factors and stated that studying the predictors of epilepsy after TBI should become one of the priorities. The successes and challenges in the implementation of the 68th WHA Resolution on Epilepsy were presented by E. Gusev and A. Guekht. They demonstrated that epilepsy is comorbid to stroke and other major noncommunicable diseases, dramatically increasing their severity and mortality. The seminar on post-stroke cognitive impairment led by M. Freedman. The last session was opened by E. Beghi with the talk describing the mechanisms and predictors of falls in neurological diseases, including stroke, Parkinson’s disease, multiple sclerosis, and others. He stressed that stroke can be the cause of balance disorders due to impaired ability to produce fast, accurate, and coordinated muscular patterns. Several interesting talks were presented by Russian colleagues on multiple sclerosis, including the burden of multiple sclerosis (V. Mkrtchyan, N. Pavlov) and therapeutic approaches (N. Khachanova and N. Arzymanian). The novel techniques and experience of neurostimulation in gait disorders in multiple sclerosis patients were presented by the neurosurgery team of the Buyanov City Clinical Hospital (S. Asratyan). The significant part of the session was dedicated to management of ALS, presented by members of the Russian and foreign faculty. 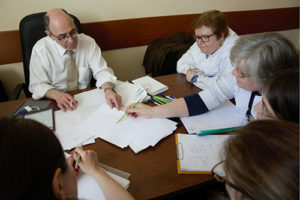 On the next day, the international faculty and the leading Russian specialists on brain diseases visited the Moscow Research and Clinical Centre for Neuropsychiatry of the Healthcare Department of Moscow, one of the leading institutions for management of patients with post-stroke cognitive impairment, depression and anxiety, suicidal ideations, epilepsy, and other brain diseases. It was the second meeting of the international scientific advisory board of the Research and Clinical Centre, formed in October 2017 during the World Stroke Day Congress in Moscow. The meeting started with an overview of the more than 100-year history of the center, presented by its director A. Guekht. The scientific achievements, patient management, and educational activity of the center, as well as the state-of-the-art facilities for diagnostics and research were quite impressive. Prof. N. Gulyaeva (Institute of Higher Nervous Activity, RAS) presented the results of studies in translational neuroscience. Then, completed and ongoing research projects in post-stroke cognitive impairment, epilepsy, depression and suicide, and autonomic disorders were presented by the specialists of the center and of collaborative institutions (Pirogov Russian National Research Medical University, A.I. Yevdokimov Moscow State University of Medicine and Dentistry, Serbsky State Scientific Center for Social and Forensic Psychiatry, Institute of Higher Nervous Activity and Neurophysiology of RAS, N.V.Sklifosovsky Research Institute of Emergency Medicine and Buyanov City Clinical Hospital). The projects were extensively discussed by the faculty, and plans for international publications and new projects had been developed. The true highlights of the meeting were a series of seminars in stroke and other brain diseases led by the eminent members of the international faculty. These seminars were of high educational value for the doctors and researchers from Moscow clinics. Prof. Peter Sandercock is emeritus professor of neurology at the University of Edinburgh. 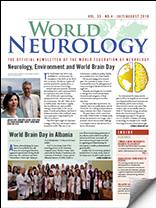 He is a member of the Board of Directors of the World Stroke Organization and chairman of the WSO Education Committee. 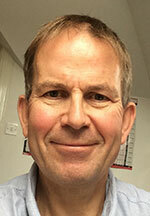 He is commissioning editor for the World Stroke Academy, the WSO’s online global educational resource.